Widely known as one of the “Fathers of the Internet,” Cerf is the co-designer of the TCP/IP protocols and the architecture of the Internet. In December 1997, President Clinton presented the U.S. National Medal of Technology to Cerf and his colleague, Robert E. Kahn, for founding and developing the Internet. Kahn and Cerf were named the recipients of the ACM Alan M. Turing award in 2004 for their work on the Internet protocols. The Turing award is sometimes called the “Nobel Prize of Computer Science.” In November 2005, President George Bush awarded Cerf and Kahn the Presidential Medal of Freedom for their work. The medal is the highest civilian award given by the United States to its citizens. In April 2008, Cerf and Kahn received the prestigious Japan Prize and in 2013 Cerf, Kahn and three others received the Queen Elizabeth Prize in Engineering. Cerf was made an officer of the French Legion d’Honneur in December 2014. During his tenure from 1976-1982 with the U.S. Department of Defense’s Advanced Research Projects Agency (DARPA), Cerf played a key role leading the development of Internet and Internet-related packet data transport and security technologies. Cerf was appointed by President Obama to serve on the National Science Board beginning in February 2013. He served as president of the Association for Computing Machinery (ACM) from 2012-2014. 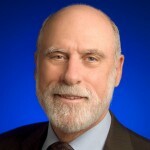 He served as chairman of the board of the Internet Corporation for Assigned Names and Numbers (ICANN) from 2000-2007. Cerf also served as founding president of the Internet Society from 1992-1995 and in 1999 served a term as chairman of the Board. In addition, Cerf is honorary chairman of the IPv6 Forum, dedicated to raising awareness and speeding introduction of the new Internet protocol. Cerf served as a member of the U.S. Presidential Information Technology Advisory Committee (PITAC) from 1997 to 2001 and has served on several national, state and industry committees focused on cyber-security. Cerf sits on the Board of Directors for the Americas Registry for Internet Numbers (ARIN) as Chairman, StopBadWare (Chairman), the Marconi Society (Vice Chairman) and the Science Advisory Board for CosmosID. Cerf also sits on the Board of Associates of Gallaudet University. He serves on the Jet Propulsion Laboratory Advisory Committee and is a distinguished visiting scientist there. He served as Chair of the Visiting Committee on Advanced Technology of the U.S. National Institute of Standards and Technology during 2006-2013. He also serves as Treasurer of the National Science & Technology Medals Foundation. Cerf is a Fellow of the IEEE, ACM, and American Association for the Advancement of Science, the American Academy of Arts and Sciences, the International Engineering Consortium, the Computer History Museum, the Annenberg Center for Communications at USC, the Swedish Royal Academy of Engineering, the American Philosophical Society, the Hasso Platner Institute and is a member of the US National Academy of Engineering. In 2011, he was made Distinguished Fellow of the British Computer Society. Cerf is a recipient of numerous additional awards and commendations in connection with his work on the Internet. These include the Marconi Fellowship, Charles Stark Draper award of the National Academy of Engineering, the Prince of Asturias award for science and technology, the National Medal of Science from Tunisia, the St. Cyril and St. Methodius Order (Grand Cross) of Bulgaria, the Terra Mariana Medal of Estonia, the Alexander Graham Bell Award presented by the Alexander Graham Bell Association for the Deaf, the NEC Computer and Communications Prize, the Silver Medal of the International Telecommunications Union, the IEEE Alexander Graham Bell Medal, the IEEE Koji Kobayashi Award, the ACM Software and Systems Award, the ACM SIGCOMM Award, the Computer and Communications Industries Association Industry Legend Award, the Yuri Rubinsky Web Award, the Kilby Award , the Rotary Club International Paul P. Harris Medal, the Joseph Priestley Award from Dickinson College, the Yankee Group/Interop/Network World Lifetime Achievement Award, the George R. Stibitz Award, the Werner Wolter Award, the Andrew Saks Engineering Award, the IEEE Third Millennium Medal, the Computerworld/Smithsonian Leadership Award, the J.D. Edwards Leadership Award for Collaboration, World Institute on Disability Annual award and the Library of Congress Bicentennial Living Legend medal. Cerf was inducted into the National Inventors Hall of Fame in May 2006. He was made an Eminent Member of the IEEE Eta Kappa Nu (HKN) honor society in 2009. In 2010 he received a Lifetime Webby Award. In February 2011 he was named a Stanford Engineering School “Hero” for his work on the Internet and received a lifetime achievement award from the Oxford Internet Institute. In addition to his work on behalf of Google and the Internet, Cerf has served as a technical advisor to production for “Gene Roddenberry’s Earth: The Final Conflict” and made a special guest appearance on the program in May 1998. Cerf has appeared on television programs such as NextWave with Leonard Nimoy and often co-hosted World Business Review with Alexander Haig and Caspar Weinberger. In July 2014, he appeared on the Colbert Report television show. Cerf also holds an appointment as distinguished visiting scientist at the Jet Propulsion Laboratory where he is working on the design and implementation of an interplanetary Internet. Cerf holds a Bachelor of Science degree in Mathematics from Stanford University and Master of Science and Ph.D. degrees in Computer Science from UCLA. He also holds honorary Doctorate degrees from the Swiss Federal Institute of Technology (ETH), Zurich; Lulea University of Technology, Sweden; University of the Balearic Islands, Palma; Capitol College, Maryland; Gettysburg College, Pennsylvania; George Mason University, Virginia; Rovira i Virgili University, Tarragona, Spain; Rensselaer Polytechnic Institute, Troy, New York; the University of Twente, Enschede, The Netherlands; Brooklyn Polytechnic; Marymount University; the University of Pisa; the Beijing University of Posts and Telecommunications; Tschingua University, Beijing, China; the University of Zaragoza, Spain; the Technical University of Cartagena, Spain; the Polytechnic University of Madrid, Spain; Bethany College, Kansas; the Moscow State University of International Relations; the Buenos Aires Institute of Technology; Keio University, Tokyo, Japan; Yale University; Gallaudet University, Washington DC; St. Andrews University, Scotland; and University of Reading, UK.